Advances in video and wireless technology have made full-color, full-motion and high-resolution video images the standard among security system providers. They are now designed to deliver indoor or outdoor views, in well-lit conditions, or when night vision is needed. Remote monitoring is now also available via a smartphone, tablet, or computer. Motion detector cameras combine a motion detector with a camera, delivering a camera that waits for activity before it begins transmitting or recording. This not only saves countless hours of DVR storage space, but also adds an additional level of protection by alerting you when it senses suspicious activity. Security cameras are only half of the video surveillance equation. To truly integrate security camera feeds into your system, as a provider, you can offer several types of devices that give your customers flexible viewing and recording features. When more than one camera is hooked into a system, it’s possible to switch between feeds, or use a video splitter to view multiple feeds simultaneously. All surveillance and security cameras tend to offer a wider field of view than standard cameras, but the “dome cameras” offered by most top security providers take this a step farther. With full 360-degree coverage, a single camera can monitor an entire area. At the other extreme, a “fixed lens” camera gives you the ability to focus permanently on a very specific area, ideal for the highest quality video image of the places that matter most. 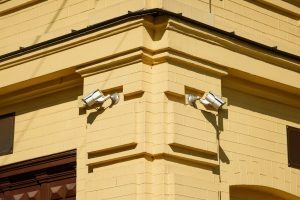 Outdoor cameras offer more durable and weather-resistant enclosures, with components designed to capture wider exterior views and accommodate the full range of outdoor lighting conditions. With many of the options offered by indoor surveillance cameras – including remote pan and tilt control, Infrared night vision, motion detection and wireless connectivity – you’ll be able to give your yard and immediate neighborhood the same level of protection as the rooms of your home. The objective of any surveillance or security camera is to provide a clear, crisp image. At Universe Optics, we offer highly accurate precision lenses that are designed to your desired specifications for use in surveillance cameras.